The group has blocked four main traffic arteries in central London since Monday, and on Wednesday it began a day of “light” disruption of the city’s overground network. Police officers then climbed up onto the train roof to unstick the protesters before removing them. 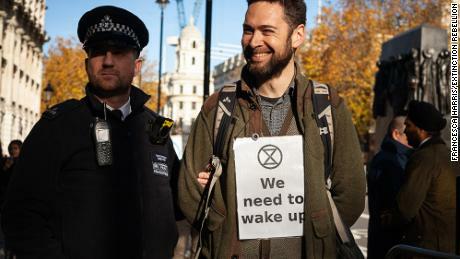 Extinction Rebellion say this set of protests will take place in at least 80 cities and more than 33 countries. The group, which is founded by British activists, has three aims: the first is to get governments to declare a “climate emergency,” reduce net greenhouse gas emissions to zero by 2025, and for citizens’ assemblies to lead the government on climate and ecological justice. In Oxford Circus activists flocked around a bright pink boat, daubed with the words “Tell the Truth,” as police vans gathered at the corner.